A few tanks does not an invasion make. 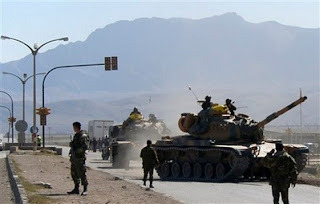 "Turkish ground troops crossed into northern Iraq in their hunt for Kurdish PKK rebels, the military said on Friday, describing the start of a campaign one report said could last 15 days [or perhaps much longer?] . . . Iraq's government urged Turkey to respect its sovereignty and avoid any military action which would threaten security and stability." What part of "invasion" doesn't the Iraqi Foreign Ministry not understand? "'We do not expect these operations will expand because they are against the Iraqi and Turkish desire to have good relations,' spokesman Ali al-Dabbagh told Reuters in Baghdad." OK, you just keep telling yourselves that. "Turkish TV said 3,000 to 10,000 soldiers had entered Iraq, but several Iraqi officials and a senior military official with U.S.-led coalition forces in Baghdad tried to play down the operation, saying only a few hundred troops were involved." "A senior military source in southeast Turkey told Reuters: 'Thousands of troops have crossed the border and thousands more are waiting at the border to join them if necessary.'" Well, as long as the Turks don't go nuts . . . and as long as they've got our back in Kosova if things go south, we'll look the other way for a while. Convincing the Kurds to just allow thousands of Turkish troops to blunder around their autonomous enclave is going to be a bit more tricky than getting the Iraqis to sign off on an all out invasion. They're used to it anyway, right? Utah: the "shoot me" state. A free Kosova forever? Not so much. Obama and Hillary misfire on guns again! The Summer War redux; this time in the spring?